Coleraine made it four wins from four on Saturday moving up to fourth place in the Danske Bank Premiership table. But Oran Kearney is refusing to get carried away just yet. Instead the Bannsiders boss focused on the development of his talented young squad. “It’s early days in the league, but the big thing for me is the development in the young players,” he told the News Letter. “It has strengthened us so much without having to go and sign anyone. “Look at Rodney Brown, he is only 20 yet has moved into left back and is playing like a 28-year-old. “He is playing with such ease and looks so comfortable in there. “But it’s the same all around the team, we’re not carrying anyone. Next up for Coleraine is a trip to Cliftonville this Saturday. “We’re in good form of late and training has been brilliant, but there’s no easy games in this league,” he said. “Cliftonville will be smarting from a defeat on Saturday and I’m sure they will have a point to prove. The Bannsiders carry a real goal threat this season. They have netted 12 times in their last four games. Striker James McLaughlin has continued on where they left off last season scoring six already this term. But the goals have also come from around the team with Jamie McGonigle, Darren McCauley and Ian Parkhill all finding the net of late. “We have serious firepower this season,” said Kearney. “Darren is starting to weigh in with goals, James’s record speaks for itself. “Brian Neeson made a couple of good saves from him last week, but the longer James is on the pitch the more likely it is he will score. “It was a great delivery by Rodney Brown and James came up with a great header, those are the ones you don’t save. “James is so much more fitter now, his fitness levels have improved so much in the past year, he’s far sharper and stronger. “It’s not just about the goals he’s scoring, but we’re seeing the rewards all over the pitch with his workrate and energy. “Gary Twigg is getting back to full fitness now and we’ve also added Jordan Allan. However, it is at the other end where they have been having difficulties. So far in the league they have dropped points after picking up all three the previous week. It happened again last Saturday at Ballymena when they slipped to a 3-2 defeat at the hands of the Sky Blues. “The season so far has not been ideal and we have not started that well,” said Lyttle. “It has been an up-and-down season. 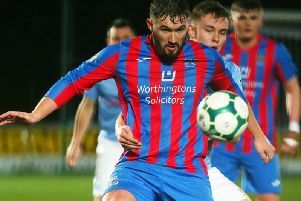 “We had two wins and then the game against Linfield was called off and maybe we lost a wee bit of the momentum we had built up. “But no excuses, we didn’t play as well as we can against Ballymena. “We also didn’t create enough chances in the second half. “We haven’t had a settled side due to a number of reasons. “But no excuses but I don’t think we deserved to get beat but I don’t think we deserved to win either. “Hopefully the lads aren’t feeling sorry for themselves. Hopefully they are angry to lose the game. “I am gutted that we were beaten by two penalties and a deflection. We started off alright and got the goal, but after the goal we stopped playing. “In the second half we started well, but it is the story of our season that we switched off at crucial times.